W. WENTWORTH PERKINS, and FRANCES J. PERKINS vs. WALTER STORKUS, MARGARET STORKUS, ETTA LANGILL, ELEANOR B. MITCHELL, and DAVID W. MITCHELL. MISC 123928 : MARGARET M. STORKUS, and ETTA LANGILL vs. W. WENTWORTH PERKINS, and FRANCES PERKINS. 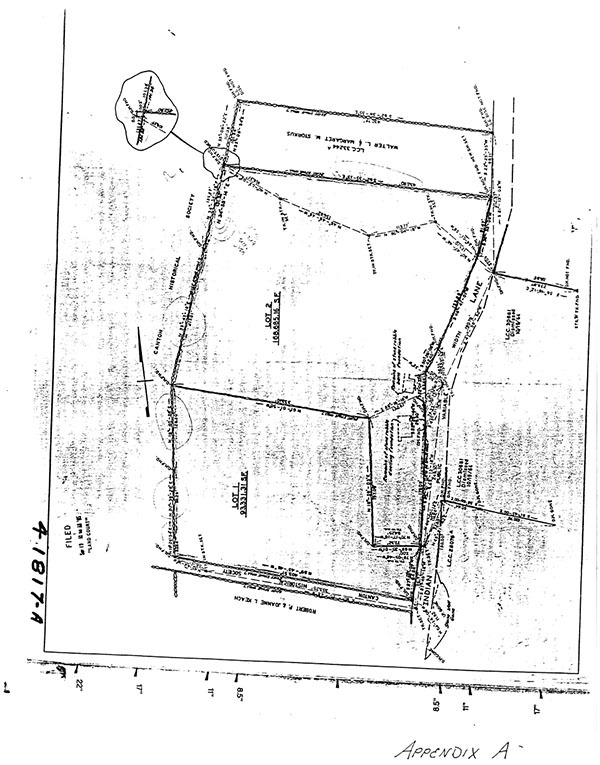 By complaint filed with this Court on September 19, 1985 the plaintiffs, W. Wentworth Perkins and Frances J. Perkins seek to register their title to two parcels of land on Indian Lane in Canton in the County of Norfolk, shown as Lots 1 and 2 on a plan (the "Plan") by Levreault Engineering dated August 13, 1983, as updated to September 16, 1985 (Exhibit No 2), a copy of which is attached hereto as Appendix A. The plaintiffs claim title on the basis of the records and adverse possession. There are two different classes of defendants who seek to defeat the plaintiffs' case. Margaret M. Storkus [Note 1] and Etta Langill allege that they are the owners by adverse possession of that portion of the premises shown as Lot 1 on the Plan. Eleanor B. Mitchell rests her allegations on a completely different ground. Both the plaintiffs and Mrs. Mitchell claim under one Robert E. Rollins who executed two deeds to the locus, or a part thereof, one to Bessie O. Royall (the plaintiffs' grantor), dated November 3, 1954 and recorded with Norfolk Deeds, Book 3318, Page 197 on November 16, 1954, and one under the name of "Robert Eugene Rawlins" to Eleanor B. Mitchell, dated May 26, 1955 and recorded on June 2, 1955 in Book 3372, Page 182. Mrs. Mitchell who appeared pro se contends that the earlier deed either is a forgery or was procured by fraud. The Miscellaneous case was brought by Storkus and Langill pursuant to the provisions of G.L. c. 240, §6 to quiet their title and remove a cloud thereon. The registration plaintiffs answered to press their G.L. c. 185 case. Mrs. Mitchell was not named as a party in the complaint. A trial was held at the Land Court on February 8, 1988 and March 25, 1988 at which the proceedings were recorded and subsequently transcribed. The registration plaintiffs, John Wieliczki, the senior assistant Canton assessor, Etta Langill, Margaret Storkus, Ruth Koufos and Helen Garland testified. All exhibits introduced into evidence are incorporated herein for the purpose of any appeal. 1. Counsel for defendants Storkus and Langill agreed to the introduction into evidence of the abstract of title including the Land Court Examiner's report. They did not dispute his conclusions as to record title, but rest their case on adverse possession. 2. At least since 1919 the Canton assessors' map has shown Lot 1 as belonging to Alfred J. Crowd or his successors and Lot 2 to Beauty J. Crowd or her successors. In 1919, however, record title in fact was in Maria P. S. Crowd to whom Daniel Crowd had conveyed a portion and who acquired the remainder by mesne conveyances through Daniel's two sons after Daniel's death. 1st. A certain parcel of land with the buildings thereon, situated in the Town of Canton, on the westerly side of South Street or Indian Lane so called. Being the same premises occupied by me as a homestead, and being the same premises occupied by my father the late Daniel Crowd. For evidence of my title and for a more particular description of this parcel of land reference is hereby made to will of Daniel Crowd dated March 16, 1863 and recorded with Norfolk Probate Records, also to deed of Daniel Crowd dated February 26, 1863 recorded with Norfolk County Deeds, Book 343 Page 93, also to deed of Daniel W. Crowd dated May 12, 1868 recorded with Norfolk County Deeds, Book 368 Page 214, also to deed of Horace D. Fuller, dated April 24, 1876 recorded with Norfolk County Deeds, Book 478 Page 257 also to Samuel C. Downes to M.P.S. Crowd, Norfolk County Deeds, Book 478 Page 257. The deed also conveyed a one and one-half acre parcel situated on the westerly side of South Street and known as the "Acorn Tree Lot", a parcel on the opposite side of South Street which is clearly non-locus, and finally a five and one-half acre piece on the westerly side of South Street described as Lot 4 on an unrecorded plan of the Estate of Abner Tilden which appears to be situated southwesterly of the property of the Canton Historical Company (see Abstract of Title, sheet 30, and Plan A). 4. The area of the first parcel in the August 17, 1920 deed is not set forth therein so it is unclear whether it conveyed only Lot 2 or whether it also included Lot 1 on the Plan. The other parcel described in the deed which might, by area, refer to Lot 1, is the Acorn Tree Lot, but the parties did not attempt to locate it. 5. John S. Crowd in turn conveyed the same premises to Beauty J. Crowd by deed dated August 17, 1922 and recorded with said Deeds in Book 1548, Page 498. Beauty J. Crowd died on October 29, 1946, Norfolk Probate No. 112451, and Olive G. Angus was named as Executrix of her will. The will devised to her niece Olive "the field and woodlot, consisting of about three acres, which is owned by me and situated between my homestead and land of the Masons", and to her half-niece Ruth Koufos and her husband Stephen (Mrs. Koufos being a witness at the trial) a cedar pasture situated on Indian Lane containing about five acres, apparently being Lot 4 above­ referred to, and finally to her daughter Amy G. Harrison for life, her homestead not otherwise disposed of by the will. After the death of Amy G. Harrison, the homestead was given to her grandson, Robert E. Rollins, with the wish expressed that it not be sold or alienated and that he in due time convey to members of his family. Any residue of the estate then went to the decedent's three daughters and her son. 6. The Land Court Title Examiner was of the opinion that the three acre piece devised to Olive G. Angus was situated on the opposite side of South Street, but I believe this devise may be of Lot 1, although the area as stated in the will is greater than that shown on the Plan. Those who allege that they are Olive's successors have not attempted to show, however, where this piece is situated. the land in Canton described as follows: Land on the westerly side of Indian Lane with the buildings thereon consisting of 3 1/4 acres and the land on the easterly side of Indian Lane directly opposite consisting of 2 acres, said land being the same bequeathed to me u/w/o Beauty J. Croud which was proved November 27, 1946 in the Norfolk Probate Court No. 112451, of which Olive J. Angus was executrix whose final account showing distribution was allowed December 30, 1948 and in which the late Amy G. Harrison of Canton, now deceased, had a life estate under the terms of said will, said Amy G. Harrison having deceased September 8, 1954. For my title to same refer to Norfolk Probate No. 112451. Bordered on the Easterly side by Indian Lane formerly South Street. 9. By deed dated August 27, 1956 and recorded with said Deeds in Book 3500, Page 252, Bessie O. Royall conveyed to the plaintiffs the premises on the westerly side of Indian Lane as described in the deed to her. 10. During the years since the acquisition from Ms. Royall, Mr. Perkins has attempted to develop not only Lot 2, but Lot 1 as well. He filed with the Canton Planning Board at least three plans thereof, but the hearing stage, pursuant to the provisions of G.L. c. 41, §81T, was never reached. Apparently there was no public notice of the claims of the plaintiff. He contended, however, that he had unclogged the drain on the property and had arranged for percolation tests, and that those working at his request on the latter project had not been asked to leave the property by the defendants Langill and Storkus. He also alleged that he had paid taxes on Lot 1, but no such bills or checks as evidence of payment were introduced into evidence. Indeed, Mr. Perkins was an evasive witness who had difficulty remembering the most basic facts about the property, although this may in part have been due to his age. It is clear, however, that Lot 2 was assessed to him as Lot 1 was not and that he had paid the taxes on it. After he had bought the premises, the Canton authorities directed him to take down the homestead because of the fact that it had deteriorated to such an extent that it now posed danger. The filed plans indicate that the building was situated entirely on Lot 22, and therefore it would appear that this activity, which culminated in the burning of the house by the Canton Fire Department, was situated on Lot 2. It was impossible to tell if any of these acts took place on Lot 1. Mr. Perkins also claimed to have unclogged the drain which crosses the land leading to land of the Historical Society, and indeed such a drain appears on the topographical plan (Exhibit No. 7), although counsel for the defendants was unable to locate it on the ground. Other elements which comprise the plaintiffs' claim of adverse possession on the property including listing it with real estate brokers, cutting up Christmas trees and permission granted to bird watchers to enter the locus. 11. The evidence also was weak as to activities by Olive Angus under whom certain of the defendants allegedly claim use of the property. The witnesses remembered expeditions to Lot 1 to pick blueberries, walk the boundaries, and cut hay for the farm animals kept by John Angus, Olive's husband. Indeed there was testimony that he took his goats across the street from the Angus house to graze on Lot 1 and that John would burn the land every three years, a practice prevalent in New England in days gone by. 12. It is clear that from approximately 1971, Olive Angus and those claiming under her, paid the real estate tax bills issued first to Alfred Crowd and then to Olive for a 1.6 acre parcel of land at Indian Lane being Lot 1 on the assessors' map 100. As early as 1919 the predecessor map of the assessors showed this parcel in separate ownership from what is now the adjoining Lot 2, although there is no evidence as to whom the parcel was assessed during the fifty years between 1920 and 1970 and certainly not as to the identity of the person who paid the bills. 13. Olive Angus is now deceased, and there was no evidence before the Court as to whom she devised the real estate. I turn first to the claim made by Mrs. Mitchell. The differences both in the spelling of the name of the grantor between the deed to the plaintiffs' predecessor and the deed to her are puzzling as is the difference in the descriptions of the granted premises. The second deed also contains a release by Elsie Texeira Rawlins, wife of the grantor, whereas the deed first in time does not. However, more than ten years have elapsed without the recording of a notice by any spouse. G.L. c. 189, §16. See Rudow v. Fogel, 6 Mass. App. Ct. 822 (1978), S.C. 376 Mass. 586 (1978), 12 Mass. App. Ct. 430 (1981). No expert witnesses testified as to the genuineness of the signatures on either deed or of the circumstances surrounding their execution. Accordingly, there is no evidence before me of either forgery or fraud and I, therefore, must find for the plaintiffs as far as the Mitchell claim is concerned since G.L. c. 183, §4, gives priority to the deed first recorded. While it is true, of course, that the plaintiffs have the burden of establishing their right to register their title by a preponderance of the evidence, the defendant Mitchell bears the burden insofar as proving the "Rollins" deed to be fatally flawed. This she has not done. Adverse possession so far as Lot 2 is concerned also was shown by the plaintiffs to buttress their title, but the doctrin e of color of title as to the remainder of the land they claim is not applicable here. See Norton v. West, 8 Mass. App. Ct. 348 (1979). As set forth above, in a complaint pursuant to the provisions of G.L. c. 185, the plaintiffs bear the burden of establishing by a preponderance of the evidence that they hold title to the premises sought to be registered whether by matters of record or by adverse possession. The plaintiffs have not borne this burden so far as Lot 1 is concerned, for the description in the deed to them from Bessie O. Royall clearly refers to an area of 3 1/4 acres which is the size of Lot 2 on the filed plan, is the location of the buildings comprising Beauty J. Crowd's homestead; and is the lot composed by stone walls. Nothing was added to the conveyance by the use of the words in the part of the deed immediately following the identity of the grantees "with statutory rights of homestead in petitioners". This had no relationship to any claim to additional properties of Beauty J. Crowd and did not convey any premises not specifically described. Conversely, the evidence to support the claim by the defendants Storkus and Langill fall short of that needed to establish title by adverse possession as well. I find it insufficient to prove that Olive Angus had title by adverse possession at the time of her death, and no evidence as to her record title was offered. The strength of the Angus claim is the payment of taxes, but that was for a period of some 17 years (if one included within this category those claiming under her). [Note 2] It is true, of course, that the Canton Assessors apparently have assessed the parcel in question apart from Lot 2 for nearly 70 years and that presumably those taxes were paid by the defendants' predecessors. In addition, Mr. Angus is said to have kept his goats on the road, to have burned it periodically and to have cut hay thereon. Activities such as blueberrying and cutting Christmas trees, in the case of the plaintiffs when challenged, differed little as to what general members of the public might do. Moreover, the defendants did not establish their status as successors in title to Olive Angus even if she did hold title or their right to tack onto whatever adverse claims she might have been able to show. In the registration case the Court rules only on the adequacy of the title of the plaintiffs and does not register title in anyone else. Accordingly, I find and rule that the plaintiffs have estblished registerable title pursuant to the provisions of G.L. c. 185 to Lot 2 on the filed plan, but that they have not shown such title as to Lot 1. So far as the Miscellaneous case is concerned, I find that the plaintiffs have not shown sufficient evidence of adverse possession on their own behalf nor of their status as successors to Olive Angus and their right to claim the benefit of such acts of hers as they claim constituted adverse possession. Indeed even if their right to stand in the shoes of Olive Angus had been shown, evidence of adverse possession by her was not convincing and did not establish her title thereby. Accordingly, a judgment will be entered in the Miscellaneous matter dismissing the action. It would seem that the plaintiffs in the two cases would be well advised to work out their differences. [Note 1] Walter Storkus also answered, but there was no evidence introduced to show he had any interest in locus. Similarly, David W. Mitchell appeared but he too has no claim. [Note 2] If the plaintiffs had shown record title, then the filing of their complaint in 1985 would have stopped the running of the adverse possession clock.